Where to Buy Trelona ATBS Home Monitoring Kit, Trelona ATBS Home Monitoring Kit - 16 Stations Plus - $259.95 for Sale with Fast Free Shipping! Trelona ATBS Home Monitoring Kit - 16 Stations Plus Replacement provides a full service preventative termite control program, with the use of active bait only when necessary. By buying this product & leave product review you can collect normally 25 reward points as a voucher of $2.50(1%). Trelona ATBS Home Monitoring Kit - 16 Stations Plus provides a full service preventative termite control program, with the use of active bait only when necessary. This system is primarily for homeowners that want to protect their home but do not currently have active termites. If you have termite currently, You may use Trelona ATBS Direct Bait stations or Trelona ATBS Annual Bait Stations or may need more Trelona compress termite bait cartridges even included 4 Trelona compressed termite bait cartridges. Trelona ATBS offers faster discovery and continued feeding promotes faster control with the help of genuine transfer effect technology. Trelona ATBS can be a stand-alone structural protection treatment or if termite activity is found on or in the home, it can be used in conjunction with a partial or full liquid treatment. Trelona ATBS (Advance Termite Bait System) delivers certainty and flexibility to pest management professionals (PMP’s) who want improved control, profitability and price assurance as part of a successful termite baiting business. 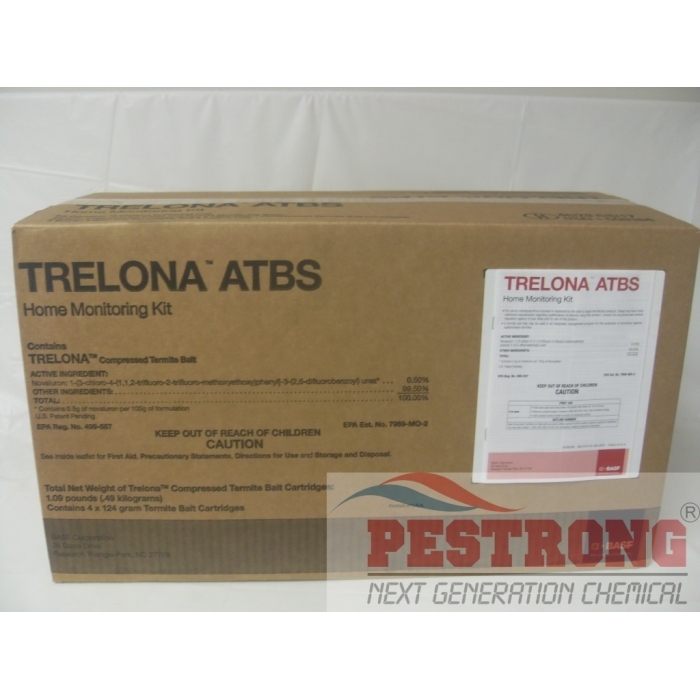 Trelona ATBS Home Monitoring Kit contains 16 stations preloaded with termite inspection cartridge (TIC) and termite monitoring base (TMB), also Additional Replacement Components: 4 Trelona compressed termite bait cartridges(poison), 4 termite inspection cartridges, and 3 station lids. Drop in active Trelona bait when needed. Install station every 15 foot intervals.